Dano Byrne had just equalised for Bohemians, Keith Ward had uprooted the corner flag out of the ground with a strike that Byrne himself would have been proud of and the celebrating Bohs fans were in ecstasy. For the best part of 70 minutes, the Gypsies supporters had stood there and watched as their team looked for a way into a game that had repeatedly flirted with getting away from them. And then, just like that, a brilliant cross from midfielder Dylan Watts was buried into the back of the net by Byrne to bring Bohs roaring back into the match. he Bohs end of the Main Stand erupted after Byrne’s equaliser as players made their way through Gardai and stadium stewards to celebrate with their hysterical fans, but unfortunately that is where the celebrations ended, as a collection of Bohemians fans soon made their way through the Main Stand and towards the Rovers supporters. Fights broke out, spit was launched and fans near the Shamrock Rovers Ultras section on the opposite side of the stadium quickly grew restless as several supporters attempted to scale the advertising boards and make their way over towards the commotion on the other side of the pitch. When I turned and looked behind me at the supporter berating the Garda riot squad, the man questioning how his taxes were being spent, I could see dozens of other fans lurking just over his shoulder launching their way into similar tirades of their own. 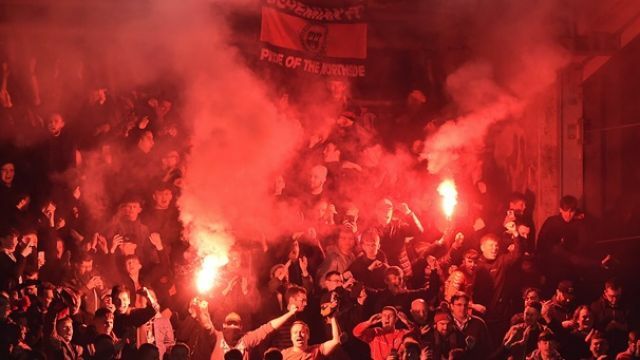 The atmosphere at the Dublin derby is by some distance more heated than any other League of Ireland game, but when some of the Bohemians fans marched their way through the stands looking to take on whoever stood in their way, the feeling at the ground soon turned sour and aggressive as dozens of Rovers fans descended from the stands towards the advertising boards where they were met by Gardai and stewards. Over four minutes had passed between the time Ward had booted the corner flag out of the ground and Graham Burke was allowed to restart the game from kick-off. Tensions had escalated dramatically during those intervening minutes. A fight broke out in the East Stand where a man was brought quickly into the stands by his friends to evade the attention of onlooking Gardai. Several fans had hastily approached individual officers to ask why there had not been more done to stop both sets of fans from clashing on the opposite side of the stadium. And in the midst of it all, a teenager wearing a North Face jacket had found the time to stare me dead in the eye before lighting up a cigarette. 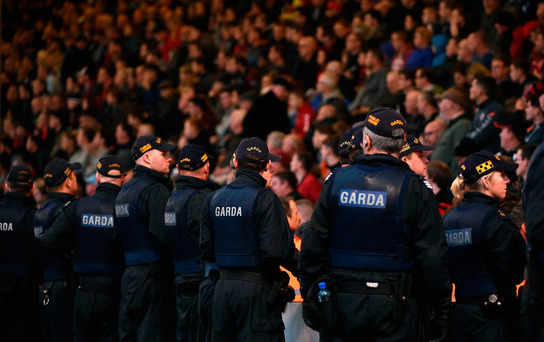 Smoking inside the stadium was the least of the stewards’ worries on Friday night in Tallaght. Those that have attended Dublin derbies in the past will be well aware of the extra security presence at these games, but it’s been two years since I last went to a match between Bohemians and Rovers, and I was still startled by the sheer volume of Garda presence given the number of fans expected. An hour before the match, I stood at the traffic lights waiting to cross the N81 and counted 20 police officers that I could see from where I was standing. Some were directing traffic. Others patrolled the paths. Four officers were mounted on horses just down from the entrance of the Maldron Hotel, while another four gathered just outside the away entrance with German Shepherds nestled by their sides. I hadn’t even crossed the road yet and it already looked like I was approaching the aftermath of a riot rather than the start of a football match. International football matches can attract a similar variety in police presence, but Tallaght Stadium has a capacity of 6,000 people. The Aviva Stadium seats 51,700 at capacity. The biggest concern among Rovers fans before the game was how could their side win games with two underperforming goalkeepers. The biggest concern after the full-time whistle was what will happen outside the grounds after a 99th minute winner and a fight in the Main Stand? The Bohemians bench emptied after the full-time whistle and the Bohs players had walked over to the corner of the Main Stand to celebrate Darragh Leahy’s 99th minute winner with their ecstatic fans, while over in the East Stand, the Shamrock Rovers players stood and clapped their supporters to vitriolic abuse from a significant number of their fans that chose to hang around. Some applauded the player’s efforts, others headed for the exits, while dozens of fans took the opportunity to let their side know exactly how they felt about their latest derby defeat. It seems like their voices did not fall on deaf ears either. “Where the f**k does he think he’s going?” A Shamrock Rovers Ultra asked a fellow fan as Hoops manager Stephen Bradley made his way towards the tunnel. As the Ultras took down their banners and paced back and forward behind the advertising boards, the Bohemians fans swiftly reminded them of how a game they were once leading got away from them. “110%” a Rovers fan muttered to himself while taking down a banner. Just before I exited the East Stand, I spotted a middle aged Rovers fan slumped into his seat while his friends stood a couple of metres away from him talking to each other. The man’s shoulders had dropped by his side, his elbows were parked firmly on his thighs and his hands were held together while he looked off into the distance – disengaged from conversation, sitting in silence, hurt by what he had seen. A 99th minute winner in favour of your biggest rivals can do that to people. When the stadium emptied Gardai effectively ensured that both sets of supporters would not meet in the streets following the match – like they had in the stands less than an hour earlier – as blue lights shone like beacons around The Square in Tallaght. Gardai on bikes tailed teenagers running around the car park and the nearby Luas stop, Bohemians fans sang until there was no one left there to listen to them and one Rovers fan summed it up best while standing in front of me in the queue at McDonald’s. “How was the game?” his friend asked him. The boy stepped forward to speak, put one finger on his glasses to move the frames closer to his eyes before letting out a deep sigh followed by a heavy inhale. He could not find the words to do it justice. You and I both kid.